Ultra high-resolution hydrographic survey for critical under-keel clearances. Hydrography is the science that deals with the measurement and description of the physical features of bodies of water and their littoral land areas. Special emphasis is usually placed on the elements that affect safe navigation and the publication of such information in a suitable form for use in navigation. 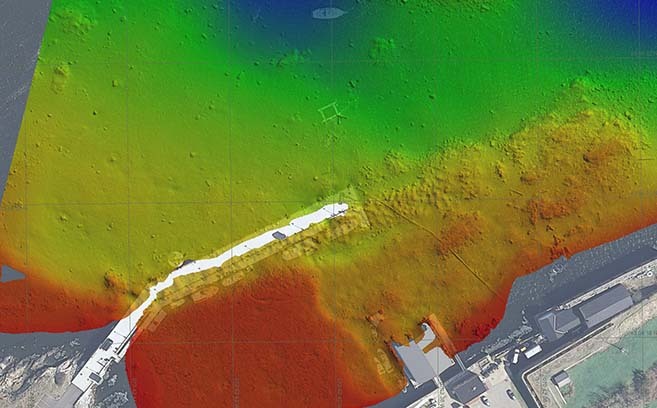 A hydrographic survey can provide such descriptive information as depth of water (bathymetry), the nature of the seafloor material, features of the seafloor, and the presence of objects on the seafloor. Used for accurate nautical charting, hydrographic survey data also is necessary for dredging operations, cable routing, fisheries habitat research, marine structural and foundational analysis, archaeological site surveys, and numerous other applications. See some examples from Substructure.